On August 5, the Africa Growth Initiative at Brookings hosted U.S. Trade Representative Michael Froman for a conversation about the future of the African Growth and Opportunity Act (AGOA). Signed into law in May 2000, AGOA offers African countries that open their economies and build free markets trade incentives with the United States. Set to expire in 2015, AGOA is a defining pillar of the U.S.-Africa trade and commercial relationship. The Office of the U.S. Trade Representative is playing a key role in the discussions on AGOA’s extension and expansion post-2015, and on how trade with Africa can foster development for the region. Ambassador Froman was sworn in as the 11th United States Trade Representative (USTR) on June 21, 2013. Ambassador Froman previously served at the White House as assistant to the president and deputy national security advisor for international economic affairs. He has also served as the U.S. sherpa for the G-20 and G-8 Summits, and staffed the president for the APEC Leaders Meetings. Brookings Trustee Liaquat Ahamed provided introductory remarks and Mwangi S. Kimenyi, director of the Africa Growth Initiative, moderated the conversation. The African Growth and Opportunity Act (AGOA), one of the defining characteristics of the trade and commercial relationship between the United States and Africa, will expire on September 30, 2015. So far, there have been heightened discussions both by African and U.S. policymakers on the post-2015 commercial relationship between the United States and African countries, excluding North Africa. These discussions have largely focused on whether to extend the current legislation, and, if so, for how long, and what elements of the current legislation should be changed. Although there have been propositions as to what may happen under different scenarios, these are not supported by hard empirical evidence and thus are not very useful in informing the design of the post-2015 relationship. As AGOA’s extension is debated, it is important to have empirically based analyses of how changes to the legislation could affect trade patterns as well as how changes in the global trading environment could affect U.S.-Africa trade volumes and African economies more broadly. 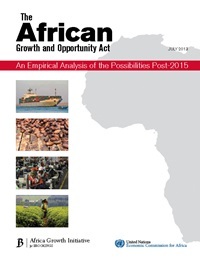 This report provides an analysis of outcomes of U.S.-Africa trade under five categories of post-2015 scenarios. These scenarios look at the trade and income implications of i) not extending AGOA beyond 2015; ii) expanded product eligibility for AGOA; iii) revisions to the currently eligible countries; iv) a restructuring of AGOA to resemble the economic partnership agreements (EPAs) of the European Union; and v) the effects that a possible EU-U.S. free trade agreement (FTA) could have on AGOA or an EPA-like situation, with an additional scenario examining how a continental free trade area (CFTA) would play into such an integrated trade environment. These findings suggest certain recommendations for policymakers, including extending AGOA beyond 2015: Without an extension, there will be declines in African exports, economic diversification and employment for many AGOA-eligible countries. The results indicate, first of all, that should AGOA not be extended and current AGOA-eligible countries revert back to the U.S. Generalized System of Preferences (GSP), then trade losses would be distributed in a very unequal fashion across the continent due to the variation in AGOA-eligible products that are exported by different countries. The results also show that expanding product eligibility for AGOA would only have small effects on the exports coming from AGOA-eligible countries— unless complete duty-free and quota-free (DFQF) market access was granted because the most import- sensitive sectors for the U.S. (e.g., sugar, cotton and clothing) are still where Africa would gain the most. The results of the analysis also show that U.S. producers and exporters would not be affected by providing these additional benefits. In addition, the analysis shows that excluding middle-income countries that are currently eligible for AGOA or adding other non-African least-developed countries (LDCs) that are currently not AGOA-eligible would result in considerable trade losses and increased competition for Africa. Last, the results show that EPA-like agreements could result in large losses in tariff revenue for African countries, but also demonstrate the importance of regional integration because there is a higher increase in intra-African trade when EPAs are in place with a CFTA instead of the currently proposed regional FTAs. These findings suggest certain recommendations for policymakers, including extending AGOA beyond 2015: Without an extension, there will be declines in African exports, economic diversification and employment for many AGOA-eligible countries. Thus, there remains a strong case for continuing or expanding the current preferences. The results also show the importance for regional integration of allowing African exporters to remain competitive, and making efforts toward offsetting the potential tariff revenue losses that could be experienced with EPAs (or agreements like them) or external FTAs that would compete with African exports. Increased trade assistance and investment will likely be necessary for countries to ensure sufficient progress in this area. There is also an obvious need for policymakers to examine the idea of granting complete DFQF access to the U.S. market for Africa because of the large benefits it would provide for AGOA-eligible countries and the low cost to the U.S. They should also be careful in considering an extension of AGOA benefits to LDCs outside Africa due to the negative effects it could have for African economies. Last, there is an obvious need for AGOA-eligible countries to further exploit the benefits of the trade preferences available under the legislation. Filed Under: AFRICA, CONTRIBUTORS, MEN "Positive Action", Uncategorized Tagged With: Africa, Africa Growth Initiative, African women, Ambassador Froman, American - African trade, economy, The Brookings Institute, women.